If you knew anything about the nuts and bolts of film/TV production, you'd know that the $20MM ceiling disqualifies 80%+ of studio movies. Most of the big movies you see in the cinema are $100MM-$200MM or more. 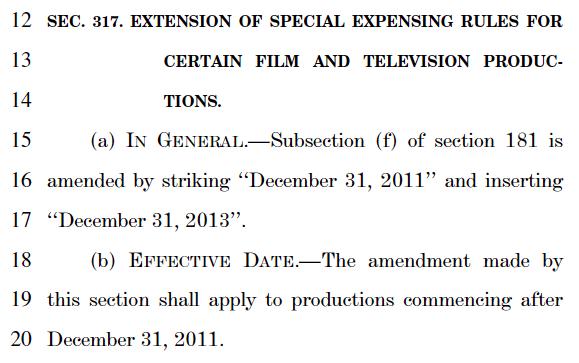 So section 181 benefits smaller independent movies that create jobs. If you know real, blue-collar entertainment workers (electricians, truck drivers, greensmen, carpenters) you know that the biggest loss of jobs has been to overseas production. Productions shoot in Canada, Bulgaria and other countries to cut costs and collect incentives. The tax deduction in section 181 only applies to projects shot at least 75% in the USA. This will bring jobs back to the USA, as well as the money that a production spends on local businesses -- which means even more jobs. The section 181 deduction provides tax incentive for investors to back films made in the US using American workers. It stimulates the economy and helps out a lot of middle-class workers who have lost work to foreign competition. This is a tax break that helps the little guy in the entertainment industry, not the corporate titan. It took a lot of effort to get this break which is tiny in comparison to other tax incentives given to the rich in other industries. Please don't ruin it for those who really need it.